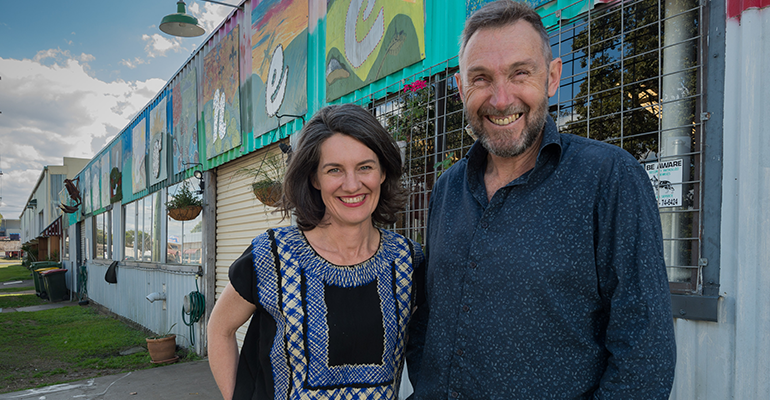 An ethical food social enterprise has raised more than two million dollars through equity crowdfunding to become Australia’s first community-owned local food hub. Food Connect co-directors Emma-Kate Rose and Rob Pekin. After spending 12 years and more than a million dollars renting a Brisbane warehouse, co-directors Rob Pekin and Emma-Kate Rose decided to buy the property themselves. They saw equity crowdfunding – which allows businesses to raise funds from the public, in return for equity in the company – as a way to successfully achieve this. “We needed to find an opportunity for our farmers, customers and supporters to be able to invest in this, and along came the equity crowdfunding laws late last year which provided us with the perfect vehicle to do that,” Rose told Pro Bono News. Pekin and Rose set up an unlisted public company – Food Connect Shed Limited – to comply with equity crowdfunding legislation, and ran a three month campaign on PledgeMe with the aim of raising two million dollars. When the campaign concluded two weeks ago, Food Connect had raised $2,126,849 from 570 individual pledges. Rose said she was ecstatic they were able to reach their substantial target, which allowed Food Connect to become Australia’s first community owned local food hub. “We can now provide the space for organisations that have that food justice mantra but also local food entrepreneurs who want to start their business in an affordable way, by sharing the infrastructure with other entrepreneurs in the space,” she said. Rose said the campaign’s success showed the power of equity crowdfunding to support social enterprises – which have traditionally struggled to attract the finance to grow their business. “I really feel that equity crowdfunding is perfect for social enterprises that have already built up a supporter base, because these customers can then participate economically in the business by becoming their principal investors,” she said. Of the 570 pledges made, 95 per cent of these investors were women. Rose said it became clear during the campaign that property ownership was often out of reach for many women, and that being able to have a small investment of $500 through equity crowdfunding provided that access. “It wasn’t something intentional at the beginning of the campaign, but it’s just one of those great stories that have come out of it and I can really see this becoming the norm in future campaigns,” she said. Food Connect’s fundraising efforts follows the success of Enova Community Energy’s equity crowdfunding campaign, which recently raised $1,021,540 to expand across Australia.